There is no elegant, poised way to clutch a crayon. As your fingers fist-wrap around the wax and shoulders hunch instinctively over paper, this world of adult falls away in scales. The little stub of wax; is now the portkey to the land where imagination startles bright, where friends are forgiven with pinkie-hugs and “I want to be a discover and a explorer and a scientist and a writer and a doctor” is more within grasping distance than ever. “Draw outside the lines, the sky doesn’t have to be blue…” the voices different from the ones that built the scaffolding around you when you signed away your day between 8 and 5. 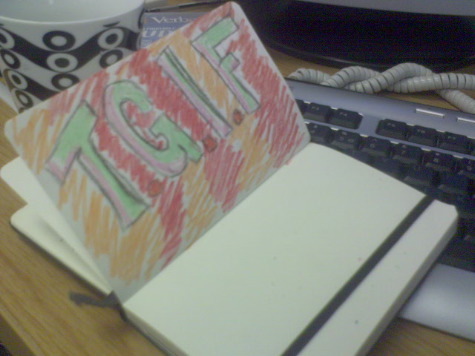 When the amnesia of adult sets in, and the priorities of living cloud and numb; find a crayon. Hold it. hey im reading it a week late – but hey it still applies! Hi This is really a nice blog.Thanks for sharing.Mashallah will have to come for more if you don’t mind. and nobody admits to the wonderful taste of crayons! i visited the little house i grew up in last sunday, and my eyes gleefully sought out the little patch on the dining room wall thats been carefully and deliberately repainted a countless times.. this sad adult effort may have done its job to remove the childish marks of my once tiny hands around those colourful waxy extensions.. my tools of delight :)) but the memory lives on! i take this delight onward into assumed adulthood! thanks 2 mom n dad for allowing me to scribble on the walls! and,in the spirit of non conformism, may our scribbles live on! keep scribbling, saaleha! I wonder if I try that, will my tongue pop out from the corner of my mouth. Ala drool style. Every brat does that when they ‘re colouring. It’s automantic to get the 😛 effect. i stole my nephews crayons. i’ve linked to your blog because i was battling to upload the poster. I loved this. I shall be clutching my crayola tonight! Now that, my friends, is true inspiration. There’s nothing more creative than breaking down the walls with a 10 Kilo imagination and a crayon. We drew our lives and worlds when we were still wetting our pants, then somebody burnt it all in front of our eyes with reality and we said nothing in protest.